Old Town San Diego is called the "Birthplace of California" because this was the first European settlement on the West Coast and home of California's first city. Today, it is a community filled with rich traditions, many cultures, diverse collection of arts, crafts and bountiful stories of a romantic, colorful past! Old Town San Diego is a robust community consisting of four major parks: Old Town San Diego State Historic Park, Old Town Victorian Heritage Park, a City of San Diego Whaley House Park and the city-owned Serra Museum and grounds. Our community also offers a myriad of free museums, historic sites, theatre, dance performances and live musicians that stroll our streets with their marimba music filling our courtyards, and mariachi playing amongst our shops and restaurants. Discover merchants who provide a peek into what shopping was like in the 1800s. Enjoy a delicious meal at one of our many award-winning restaurants – relish our beautiful San Diego weather on one of many patios and indulge in a refreshing "el grande" margarita – an Old Town tradition. 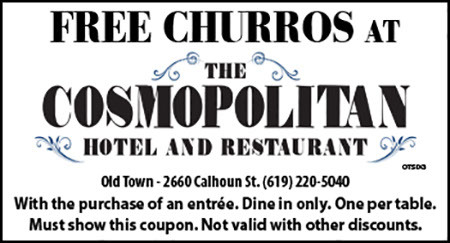 PRESENT THESE COUPONS WHEN YOU DINE AT THESE RESTAURANTS! 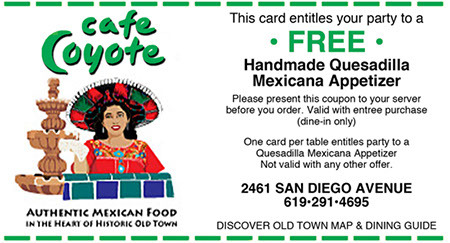 A friendly staff, loyal patrons, delicious Mexican Food, and a Festive Atmosphere have contributed to Café Coyote’s being Voted Best Mexican Restaurant 2005, 2006, 2008, 2009, 2010, 2011, 2012, 2013, 2014, 2015, 2016, & 2017! Barra Barra Saloon is known for their huge $5 Margarita and delicious creative menu items. Casa de Reyes, overlooking a historic park, is Mexican cantina offering dining in a lovely garden atmosphere. The Cosmopolitan's menu (fondly called the "Cosmo") reflects the many cultures that influenced the culinary development of Old Town. Every dish is prepared to order with house sauces, fresh vegetables, and the best proteins. At Fred’s you will experience an amazing dining experience with “Fresh Mexican Food”at a great price. With our Funky decor and great music, our high energy atmosphere Where the guest want to stay and enjoy the food, people and music.. 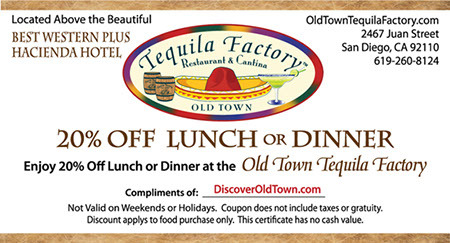 The ever popular Old Town Tequila Factory Restaurant and Cantina overlooking historic Old Town San Diego " is a terrific spot to enjoy great Margaritas and delicious Authentic Mexican Food from scratch in San Diego. Pizza Bella Italian Bistro, also known as “Old Town’s Best Kept Secret,” isn’t exactly in the heart of Old Town, but people will definitely go a little out of the heart to taste and experience their deliciousness!